We're looking to replace my wife's car, a '14 BMW 320i. She loved this car, great handling and driving response, very good fuel economy, and for her, great styling and comfort. I was happy to get her out of SUV's (last 3 previous vehicles) and get her into a sedan, but after seeing how she uses her car(s), I think a wagon would be a great choice for her. Backstory, I owned an e39 540 wagon, great car, but for those who haven't lived with one, they are very expensive to maintain. I purchased a low mileage used car, and put a 100k miles on it, but, went through the standard list of V8/e39 replacement schedule, ie. bushings, air spring, rear hatch gas springs ($$$! ), radiator, coolant tanks, AC clutch, etc., etc..
so I've looked around and the BMW wags, Audi etc, look great and drive well, but, not really interested in the long term headaches again. 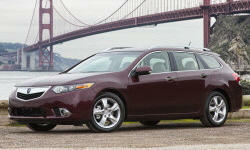 She likes the look of the Acura TSX wagon, but it looks pretty small to me. Would consider a smallish "SUV" like the X3. 1. The only Wagon (excluding the Outback) that has as much space as the VW Jetta Sport Wagen was the Acura TSX. It has a relatively large cargo area and back seat. The E91 BMW and Audi A4/Allroad have slightly less cargo with back seats down, slightly less back seat space, and far less cargo with seats up. 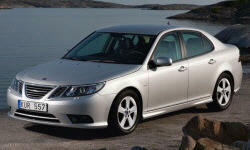 The TSX is wonderfully reliable and well made. Only downside is that it is FWD only and the power is adequate, but not great. Engine should run forever though. 2. The Volvo V60, while great looking, is practically a hatchback as far as function goes. It has similar cargo space to a VW Golf/GTI and less back seat space. Partially due to the sweeping shape of the back window. Great looking car though. Be careful pushing the wife in a direction she doesn't 100% want to go. I've made that mistake. As much as I hate crossovers, she may strongly prefer one. 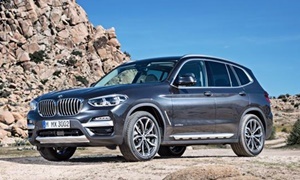 The E83 BMW X3 is built on the E91 chassis and is basically a lifted wagon. Food for thought. You might also consider something new like the VW Alltrack. Thanks for the response, funnily enough she is currently driving a TDI Sportswagen (DSG), and while she likes most of it, she has come to hate the DSG gearbox for the "jerkiness", too bad as I really enjoy this car. It too is going back to VW (whenever they decide it's time). 4. on the GTI, I have driven the latest, and it's a very fun car, I'll have to go check out the hatch, as I thought no way anything could fit back there! I'm and A4 Avant owner ('07) and have loved almost everything about it except the cost of maintenance. I wouldn't say I have had more than an average number of issues, but they were pricey to fix. I'd 2nd the TSX vote as nicer wagon and the new VW Alltrack (or the non AWD Golf/Jetta sport wagon), both mentioned above, although the Alltrack wouldn't fix your $24K max budget. On the Volvo front, the older V50 was my 2nd choice to the A4 which could be a good alternative option to the newer V60 depending on how the cargo space is laid out given I recall it was more the Volvo traditional box shape. 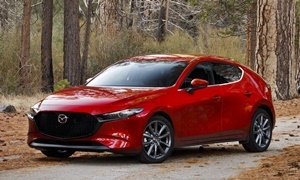 I'm generally not an SUV/CUV fan, but when it's time to replace my Audi I'd likely look at the Mazda CX-3 (maybe CX-5) just based on general reviews of Mazda making vehicles that are more fun to drive (Zoom-Zoom). Here is my Wagon comparison spreadsheet in google doc format. Volvo doesn't publish the V60 cargo capacity with seats up, strangly. Some have said it is 21 CF and some say it is 28 CF. Regarding the GTI, the back seat is similar to the Jetta Sportwagen. I'm 5'10" and can sit behind my seat ok. The DSG is better in this car - as I too was frustrated by the lag of the TDI on takeoff. 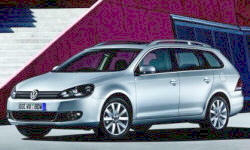 I'm not sure,, but I think the new sportwagon has a 6 speed auto, not a DSG. The regular golf does not have a DSG, I just drove one. With a younger driver coming on, that would change my calculus quite a bit - in favor of a moderately powered, safe car. I would not hand a GTI over to a young driver without some additional driver training. (Weekend schools like BMW offers). 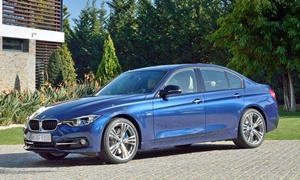 I would think and off-lease 320i might meet your budget and give your wife what she likes. 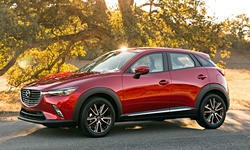 CUV's are probably more likely to roll than a sedan, another point in a wagon/sedans favor for a younger driver. Another option would be a 5 door Mazda 3 Hatchback or similar. You could go new in your price range. I don't think the TSX is as small as you think it is. 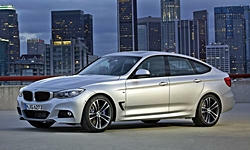 Among BMWs, if you want a car a little larger than the 3 wagon check out the 3 Gran Turismo. The hatch roofline compromises cargo space above the belt line, but whether this matters will depend on what you'll be carrying back there. 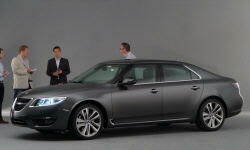 With four years older than a 2010 TSX, is the 2006 Saab 9-5 SportCombi. 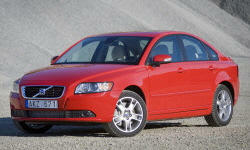 The 2004-2006 are the ones to get with Arc or Aero offering 230 hp 260 lb-ft of torque. The forums are a chock full of diy maintence and they seem to run for ever with a little TLC.